Some conservative and evangelical groups say Romney made the right move because, in the words of Massachusetts Family Institute, the anti-bullying program was “pushing a radical agenda,” and “trying to indoctrinate people on the issue of sexual preference.” Yet, that wasn’t Romney’s stance when he first took office. 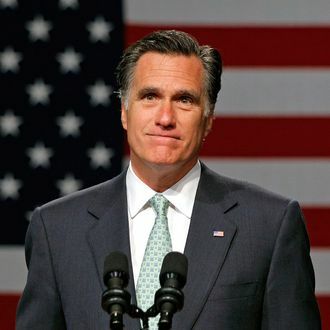 The Atlantic reports that while Romney signed proclamations supporting a gay pride march by the Massachusetts Commission on Gay and Lesbian Youth in 2002 and 2003, he abruptly threatened to shut the entire commission down in 2006. In the same year he vetoed a $158,000 budget item that would have funded counseling for victims of sexual violence in the LGBT community, along with suicide prevention. It was a surprising shift from a man who argued during his 1994 Senate run that he was more gay-friendly than Ted Kennedy. Romney hasn’t said his opinions on gay rights “evolved” during his last year in office, and it’s widely believed that he suddenly became hostile to such issues because he was positioning himself to run in the 2008 election and wanted to distance himself from the state that just legalized gay marriage. While presumably Romney remembers the incident this time, when asked for comment, his campaign referred the Globe to old comments from his time as governor, rather than explaining why his administration grew uncomfortable with merely mentioning the existence of bisexual and transgender people.